A watering hole is easy to find on the tundra of the Churchill Wildlife Management Area in Hudson Bay in Churchill, Manitoba before the area becomes frozen. 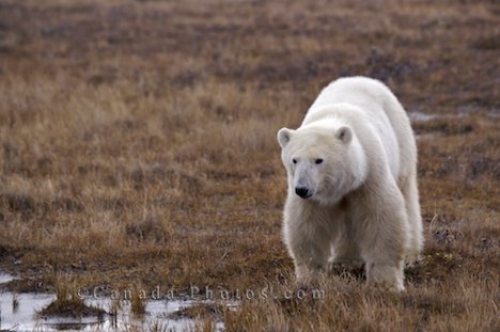 A polar bear does not need a great amount of water to survive, but when near a watering hole, it is possible a Polar Bear may decide it is the right time to have a drink. Picture of a Polar Bear standing near a watering hole on the tundra in the Churchill Wildlife Management Area in Manitoba.